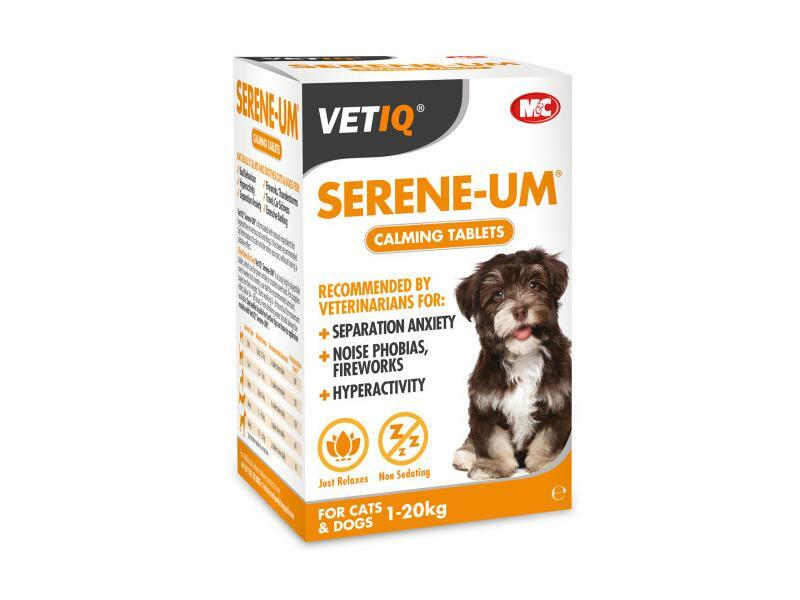 VetIQ Serene-UM from Mark & Chappell is a top-grade, non-sedating nutritional supplement offering a superb spectrum of nutrition which has been tailored to encourage a calming and relaxing effect. 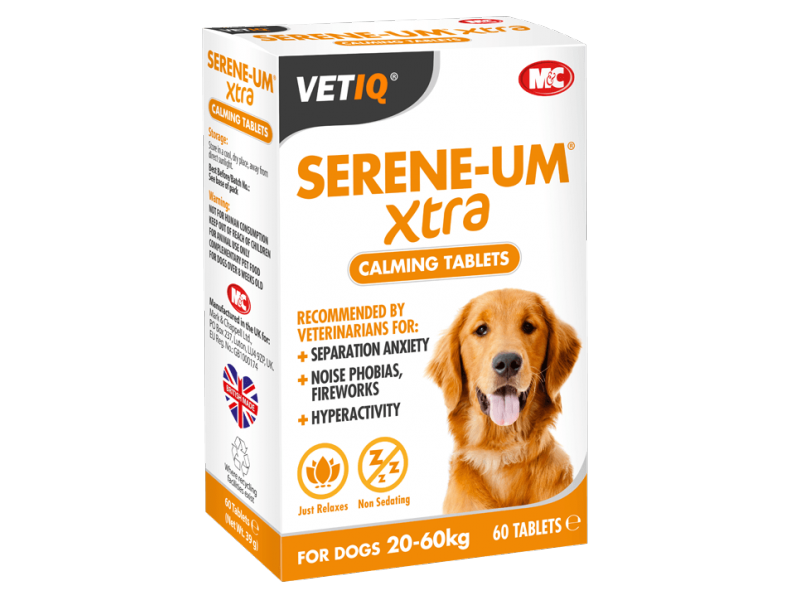 Serene-UM is particuarly useful in situations such as separation anxiety, noise phobia, fireworks and hyperactivity where pets may display aggressive or nervous behaviour. 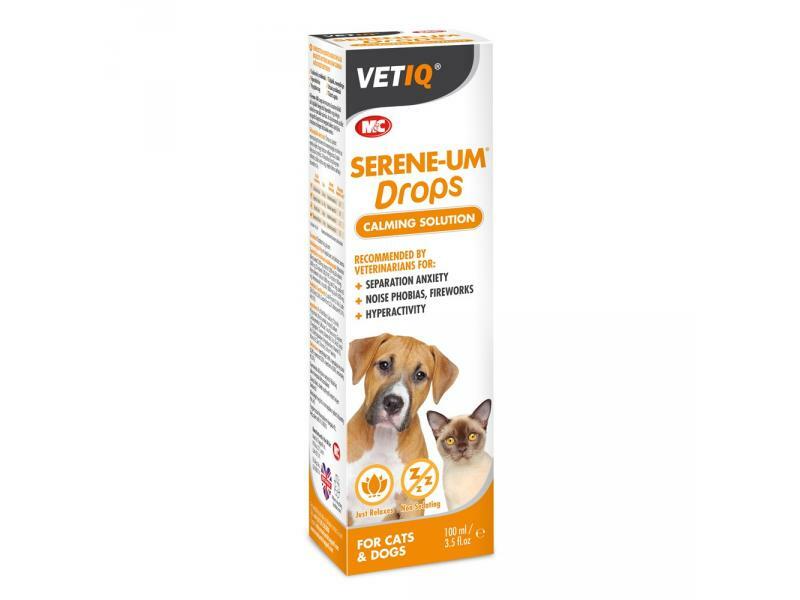 Suitable for cats and dogs, Serene-UM is available as drops and tablets for daily administration as required. Tablets can be given whole or crushed over food. Starts working 6-8 hours but for maximum effect allow 24-36 hours. Fresh drinking water should be available at all times. Below are some recent questions we've received regarding VetIQ Serene-UM for Dogs & Cats, including answers from our team. These products can safely be given together and it is fine to do that. I would suggest that you get some advice from an experienced dog behaviourist or trainer as aggression like this will not usually get better with medication alone. A very good understanding of the causes of aggression/why he gets "stressed" will be needed if it is to get better. Some cocker spaniels (red ones) I have known in the past became fiercely protective of their beds, the car, or other things and then were very aggressive if an attempt was made to force them to move. If they were encouraged to walk away from the focus of this happily, then the aggression would evaporate completely. I have no idea exactly what is happening with your dog of course, but it is certainly worth getting good advice from someone who can assess your situation knowledgeably. My very anxious 10 yr old GSDX is progressing towards end stage CDRM. I have used Zylkene in the past but it stopped being effective after a few months. She is on Calmex at the moment, which works slightly, but it is not strong enough. Could you tell me if any or all of the following can be used together: Calmex, Seren-um, Adaptil Collar and Stay Calm? I would like her to be relatively stress free, without sedation, for the short time she has left. There is a slight duplication of ingredients between Calmex and Serene-um, though they still could be used together. Both Adaptil and Stay Calm are based on different ingredients and could theoretically be mixed with any or all of the other products. Personally I would certainly try Adaptil plus at least one of the others. Can i give my rottie serene um extra with medication from vets for arthritis and can i give them longterm.thankyou so much. It is completely fine to use these tablets daily and long term.